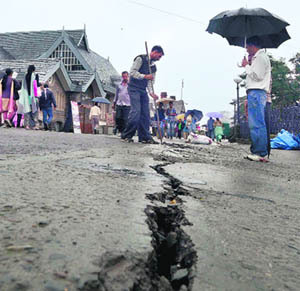 Seeking to set the record straight on the coal block allocation issue, Prime Minister Manmohan Singh today rejected the Comptroller and Auditor General�s (CAG) reports saying �allegations of impropriety are without basis and unsupported by facts�. 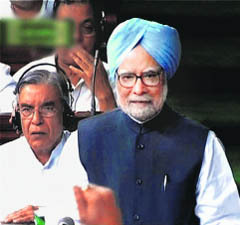 TV grab of the PM making a statement in Parliament on Monday. Following complete bedlam, three adjournments and continuous sloganeering, Haryana Vidhan Sabha Speaker Kuldeep Sharma today suspended all INLD members present in the House as also the lone MLA of the Shiromani Akali Dal (SAD) for the remaining session for �misconduct�. A fourth grade girl student of a local private school was on Saturday allegedly beaten up by her teacher for not completing her homework. Jasmine had a swollen lip and badly bruised feet when she was admitted to a hospital. 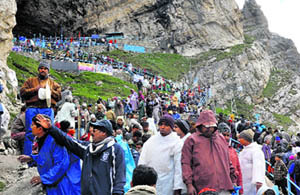 From the draft report of a high-powered panel to study facilities for Amarnath pilgrims in Kashmir, it is clear that the track to the cave shrine would be widened and there would be a firm cap on the number of pilgrims undertaking the pilgrimage.